Energetic Seniors sessions are conducted in the comfort, convenience and privacy of your own home or building’s gym. So the only thing you have to do to begin enjoying stimulating workouts is answer the doorbell. That’s the simple first step to help start the process of adding more movement to your life. But having us come to you is just one of many benefits. Other benefits include improvements in balance, muscular strength, muscular endurance, body composition, cardiovascular fitness, and functional independence in activities of daily living. 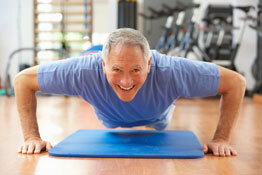 Be you “Boomer” or Senior, almost anyone, at any age, can do some type of physical activity. The goal is to move at a pace that is challenging, yet individual and also allows you to have fun while addressing the improvements you would like to make. Movement is one of the first skills human beings learn, and it often seems to be one of the first skills we leave by the wayside as the years pass. Many of the changes in the body that we associate with part of the normal aging process have their roots in inactivity. Our goal is to pass on the spark of our passion for physical activity and to enkindle the same enjoyment in seniors. The fact that an Energetics Senior trainer was able to come to my parents’ home after physical therapy programs were completed was both beneficial and enjoyable. I also have seen the positive results of continued physical activity over the years from my aunt, who is over 100 years old, and yet continues to stay active and independent.